For many people, October marks the beginning of a candy parade that begins with Halloween and ends months later with Valentine’s Day. Let’s face it, it’s hard to always say no when everywhere you turn, someone is offering you a piece of candy. If you have trick-or-treaters in your home, the temptation may be even harder to resist. Not only do you have to stock up on candy so you can hand it out on Halloween, you also have what comes home with your kids after they’ve trooped around the neighborhood. 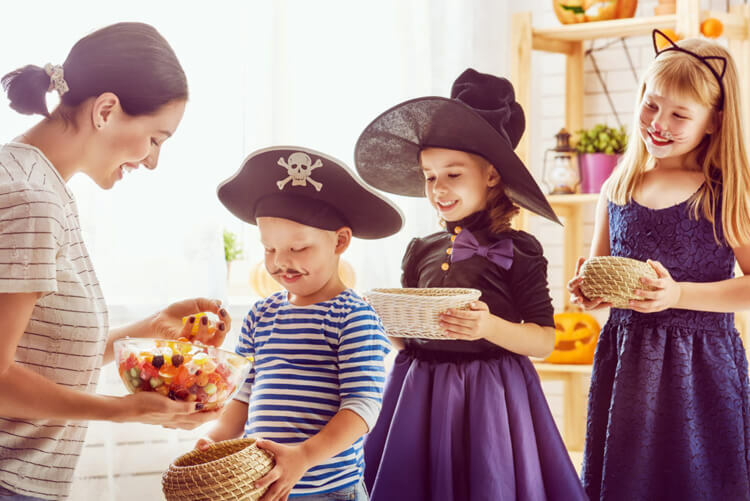 Before you give in and let your kids – or yourself – indulge in candy whenever the mood strikes, consider these cavity prevention tips for enjoying sweets. Eat candy only with a meal. Eating candy with a meal is better than eating candy by itself as a snack. All the saliva your mouth creates when you eat a meal helps wash away the sugar on your teeth. Drinking plain water also helps rinse your mouth. Don’t forget to brush and floss. Choose chocolate over sticky candy. Gummy worms. Licorice. Chewy pieces of taffy. When it comes to promoting tooth decay, sticky candies can do more damage than something like a mini chocolate bar. Sticky candies stay on your teeth for a long time, creating an ideal environment for cavity-causing bacteria. Hard candy can damage your teeth and cause cavities. Hard candy isn’t safe for your teeth whether you bite on it or dissolve it slowly in your mouth. Many people break or chip their teeth by accident from chewing on pieces of hard candy. People who like to let hard candy slowly melt in their mouth may also put their teeth at risk for cavities. Use Halloween to talk about cavity prevention, brushing and flossing. It’s possible to enjoy Halloween and holiday sweets without getting a monster cavity. Just remember to indulge occasionally, in moderation. Take advantage of the holidays as an opportunity to talk to your kids about cavity prevention. Remind them to floss daily and brush at least twice a day for two minutes.